Samuel Magill, a former pupil of Zara Nelsova, has combined a solo career with membership of a series of leading American orchestras. Previously a cellist with the Pittsburgh and Houston Symphonies he now plies his trade with the Metropolitan Opera Orchestra. I’ve not encountered his playing before but I see that he has attracted praise for recordings of music by Franco Alfano (review ~ review) and he’s also taken part in well-received discs of music by Emile Goué (review) and René de Castéra (review). This list of unfamiliar composers might lead you to suppose that Magill is prepared to venture off the beaten track when it comes to recordings and that’s true of this present disc also. So, we hear the ‘Kreutzer’ Sonata in an unfamiliar guise. Magill has written the liner notes for this disc – and very useful they are. In them he explains that it was Beethoven himself who suggested to Carl Czerny that he might transcribe that violin sonata for cello. This Czerny obligingly did in 1822. However, though Magill describes the arrangement as “fine and sensitive” he goes on to say that Czerny took it upon himself to simplify the solo part in several places for no particularly good reason. Samuel Magill has therefore made his own edition of the Czerny arrangement in which he restores many of Czerny’s alterations. In doing this he’s drawn also on an alternative arrangement by the French cellist Auguste Franchomme (1808-1884), the player for whom Chopin wrote his Cello Sonata. The result of the combined efforts of Czerny, Franchomme and Magill seems to me to work very well indeed. It seems that Czerny’s arrangement, though published was lost for more than 160 years until it was rediscovered as recently as 1992. The cello is well suited to the big, heroic stature of Beethoven’s first movement. There are also several passages which allow us to enjoy the lustrous singing tone of the cello – and Magill is very well equipped in that regard. Throughout the movement his playing is commanding, whether in the rhetorical passages or in those sections where agility is the watchword. Beth Levin partners him most effectively. Between them they give a spirited reading of the movement and one that is often fiery. The second movement takes the form of a theme and variations. Both musicians offer graceful and often witty playing. Here I especially relished the singing tone of Magill’s cello. This is a very fine performance. Their account of the short Presto finale is vivacious and rhythmically alert. Of course, the cello is a weightier instrument than the violin for which Beethoven originally conceived the music. However, in the hands of a deft cellist – and Magill is certainly that – I don’t find the added tonal weight to be a problem. As I said, I think the arrangement for cello works really well and I enjoyed this performance a lot. Though I’ve heard many recordings by the great pianist Artur Schnabel I’m not sure that I’ve come across any of his own music before. It may seem strange that a pianist who was so well versed in the Classical and Romantic repertoire should have composed in a freely atonal style; it would have been so easy for him to have written music that was a pastiche of the repertoire that he customarily played. But this is a man, Samuel Magill reminds us, who was a friend of Schoenberg and who took part in the first post war performance of Pierrot Lunaire. I suppose it’s a mark of the man and of his intellectual curiosity that he should stretch his horizons when it came to composition; much of his output is atonal. I confess I’m no great fan of atonal music and my heart sank a little when I realised from reading the notes that the Schnabel piece is an atonal work for solo instrument lasting some twenty-six minutes. In the end I found much to admire in the piece and I’m sure that the credit for that must be shared between composer and soloist for Magill is an eloquent advocate for the work. 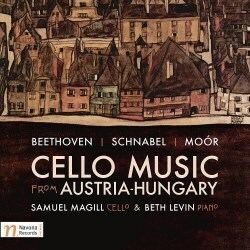 It’s cast in four movements and in this work Schnabel explores the full compass and resources of the cello; indeed, the music offers a pretty searching examination of the instrument and of the player. The first movement, Allegro con moto, is often declamatory and ardent in tone. Magill plays it with great authority. The short second movement, Allegretto, is a constantly busy creation ad clearly very testing for the soloist. The substantial Larghetto is described in the notes as “essentially a lied with constant variation”. To my ears the music is full of dark sadness and the sadness is pretty unrelieved. This is music that is demanding of the listener as well as the performer and Magill is eloquent in unfolding it. The finale, marked Vivace ma non troppo, starts off with fast, athletic music in the deliberately awkward time signature of 7/8. However, before long (at 1:19) Schnabel applies the brakes for a lengthy episode in which what Magill describes as a “dirge-like chant” alternates with short pizzicato sections. The fast music reappears (6:29) before the sonata comes to a strange conclusion in which pizzicato music fades into nothingness. I’d advise listeners to press the pause button at this point or else the start of the final piece after just a few seconds is something of a shock. This final piece is the Ballade in E major by the Hungarian-born Emanuel Moór. I freely confess that I had never heard of this composer, still less encountered any of his music. I see, however, that my colleague, Jonathan Woolf enjoyed a disc of his cello music a few years back (review) even if he didn’t feel that the music fell into the masterpiece category. I only found Jonathan’s review after I’d finished listening to this disc but, essentially, I have the same view of this present piece – which was not on the disc Jonathan reviewed. Like several other works that Moór composed in the early years of the twentieth century it was written for Pablo Casals. The piece was composed for cello and orchestra but neither this version nor a subsequent piano reduction made by Moór himself was published. It was not until 2010 that the cello/piano version was published and the piece here receives its first recording. At the start the cello plays a long, soulful melody. There follows a stretch of rather more vigorous music. Here the piano part comes across pretty strongly. I wondered if Beth Levin was playing too forcefully but as that’s not something of which she’s guilty elsewhere in the programme I think the emphatic piano contribution has more to do with the fact that she is, after all, playing the reduction of an orchestral score. It may also be connected to the recorded sound, of which more in a moment. I don’t find the vigorous music all that interesting, in all honesty, but at 5:36 a slower section of music begins, which is much more involving. This is initially introspective but gradually increases in intensity. Here the weight of the argument is with the soloist who is supported largely by a simple chordal accompaniment. Magill plays this passage with great eloquence. At 9:11 I was pleased to encounter the opening cello melody again and this soulful material sees the piece out. The Ballade is well worth hearing and it receives splendid advocacy here. I alluded to the recorded sound a moment ago. I’m in two minds about the recording. The Beethoven and Moór pieces were set down in the same sessions in March 2015. When I first listened to the Beethoven I felt that the instruments were recorded quite closely though not unacceptably so. Though one can sometimes hear the ‘scrunches’ as Magill plays the overall impression I had was that of being seated in about the fourth row in a recital hall. The Schnabel was recorded in the same venue but a couple of months later. I’m not sure if Magill is placed a fraction further away from the microphone for the Schnabel – I have the impression that that’s the case – but there’s certainly more sense of space around his instrument. The relative closeness of the balance in the cello/piano pieces is then apparent when the Moór piece follows straight on from the Schnabel. My reservation over the recorded sound is only slight and should not deter collectors. Of much greater significance is that this is a varied and enterprising selection of music and that all of it is expertly played.